We have not come here by chance, I do not believe in chance. When I see riders, parents, promoters, racers, freestylers, mortgage brokers, track directors, scorers, registration people, announcers, and countless others, all who love BMX, I do not see coincidence, I see providence. I see purpose. I believe it is our fate to be here. It is our…destiny. I believe that this year holds for each and every member of this site the very meaning of our lives. This is a war and we are souldiers. What if tomorrow there were free ride tracks, race tracks, public parks that let in BMX bikes, major college scholarships for BMXers everywhere? Isn’t that worth fighting for? Isn’t that worth everything you can give to make it happen. The sticker to the side says we are “taking the back the sport”. From whom? From no one. 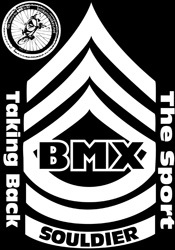 We are taking back the sport to the heydays of the 80’s when 200 riders would come to a local race, when pro BMX racers were the heros of the day. We can do this because every person who comes to this site believes in this lifestyle we call. Ask me for a sticker.